Optimal oral health is really a state of balance among our teeth, supportive gums and bone, muscles and jaw joints such that breakdown of any of these tissues is prevented. Regular examinations and preventive maintenance will be customized to your needs. Although many mouths are similar, there are never two the same. When all the factors involved in diagnosis are combined with your objectives and circumstances to arrive at a treatment plan, it is unique to you. A treatment plan that was developed after diagnostic records and consultation with you is as important as a blueprint before building a house. A treatment plan designed with your clearly defined long-range objectives can eliminate unnecessary treatment and expense. It will also avoid providing you with dental work that does not fulfill your expectations. Good communication between our patients and the dentists or staff members is essential before any procedures are done. We want you to understand what is being done, for what purpose and how it fits your treatment plan. You are encouraged to ask questions during your consultation or at any time so that you are comfortable and informed about materials and procedures and how they relate to your treatment plan. Dr. Rajesh Grover graduated from the University of Saskatchewan College Of Dentistry in the year 2001. Prior to his acceptance in the dental program, he completed a Bachelor of Arts in Psychology from the University of Saskatchewan. Dr. Rajesh Grover has been working in Alberta for 10 years and has enjoyed working with Dr. Kevin Kindley for the last two years. Dr. Grover is dedicated to providing his patients with the most current techniques through continuing education and ongoing training in various aspects of dentistry. Rajesh married Jackie Carney in 2007, a French Immersion schoolteacher, born and raised in Lethbridge. They are proud parents of a beautiful little girl and boy. Rajesh’s passion for dentistry is matched with his passion for the mountains and sports. Rajesh enjoys spending time with his family, hiking, biking, golfing, and traveling. Rajesh has traveled to Mozambique, Guatemala, and Venezuela volunteering his time and providing dental services to the less fortunate. Rajesh continues to volunteer his time in the community through his involvement in Rotary. Dr. Kevin Kindley was born and raised in Viking, AB. Dr. Kindley graduated Dentistry from the University of Alberta in 1980. After graduation, Dr. Kindley moved to Lethbridge in 1980. 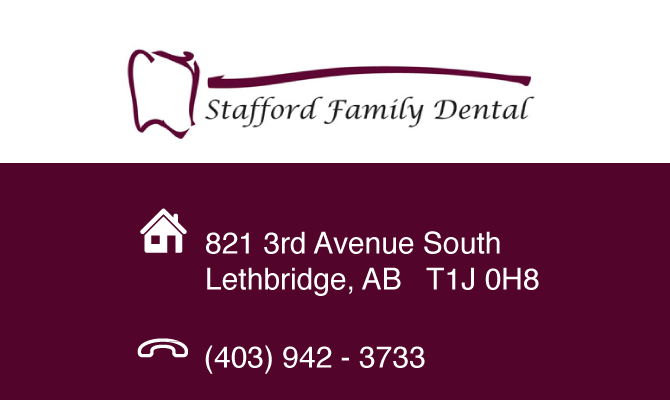 He has spent the last 31 years practicing dentistry in Lethbridge keeping up to date with the latest dental technologies through ongoing continuing education. He has enjoyed the transition to his new office, Stafford Family Dental, with the latest sterilization equipment and dental technologies with Dr. Rajesh Grover. Dr. Kindley is dedicated to providing his patients with excellent dental care. Dr. Kindley is a devoted father and husband. He spends most of his spare time in the outdoors or traveling with his wife and two boys. He has recently returned from Peru where he and his family spent their time volunteering for the less fortunate. Dr. Kindley enjoys physical activity. If he isn’t seen riding his bike to work, he is golfing, swimming or skiing.